One evening over dinner, I mentioned my lack of painting time to my husband and we talked about what I needed. 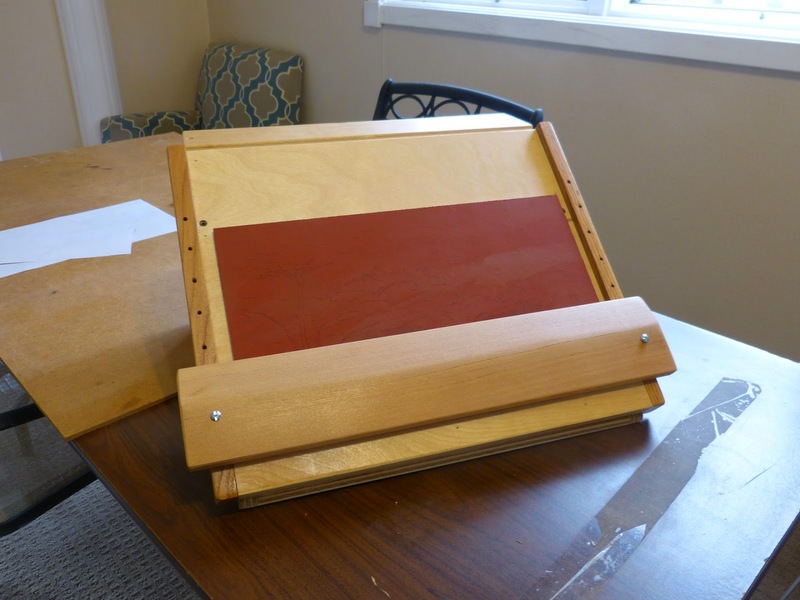 Portable desktop easel for miniatures with movable hand rest. By lunch the next day my new easel was built. A day of varnish and it was ready to use. 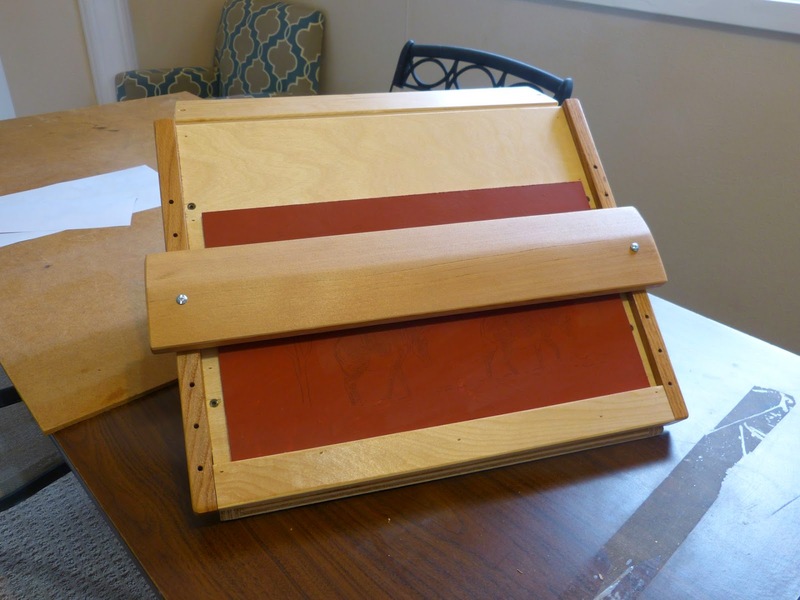 It can hold a miniature painting up to 18" wide and the hand rest can be removed. The back is open and my portable paint box fits. There is enough room at that end of the table for my palette and holes can be drilled in the top flat panel to hold my brushes. At the other end of the table the family can work on puzzles or other games and the box can be moved to other tables in which the family is gathered so I can participate. Now I can work in the studio and in the house at whatever hour I want. Several Miniature shows have my work this month. 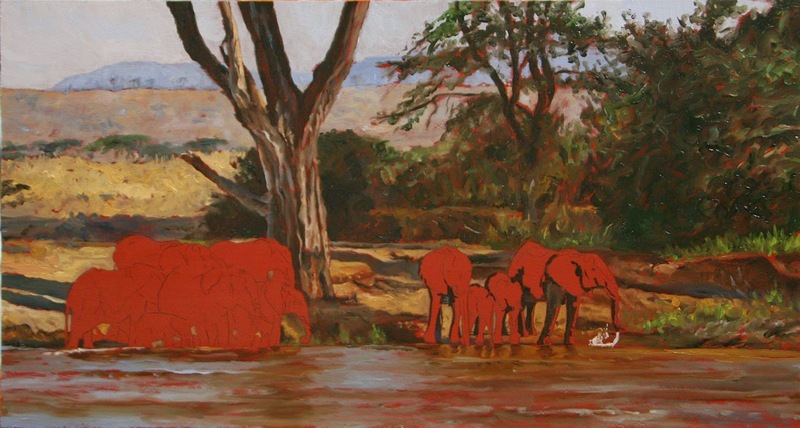 This is a great chance to own original art! 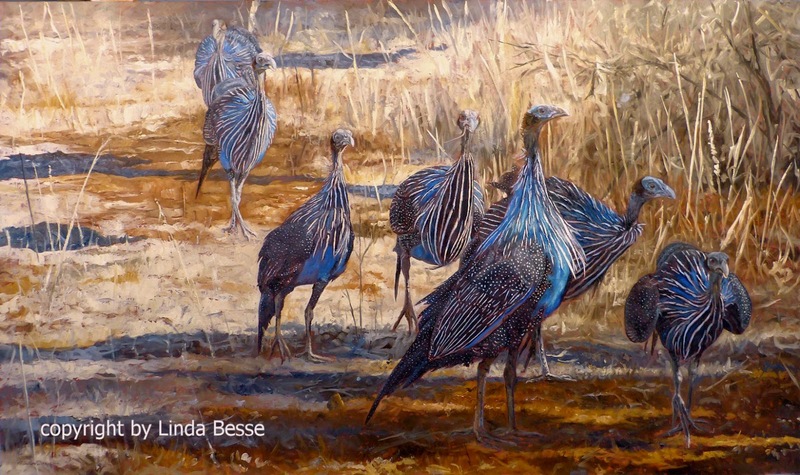 SouthWind Art Gallery in Topeka, KS, has a special reception Dec 5th from 4 - 8 pm. The show continues until the end of the year. All the miniatures in this show are 6" X 6". All the miniatures in this show are 9" X 12" (108 sq. inches) or less. And finally, Pacific Flyway Gallery in Spokane Valley, WA will have a special miniature show starting next week with a reception December 11th. The miniature requirements for this show were 6" X 9" or smaller. My piece is almost dry and I'll reveal it as we get closer to the opening. Stay tuned. 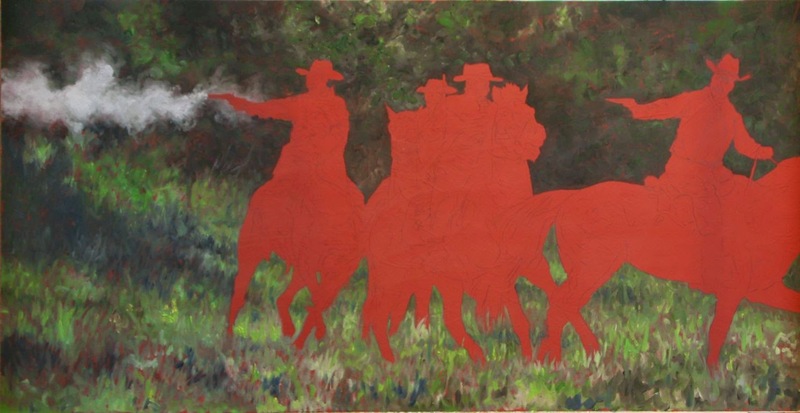 This painting is 26" X 44". Not the largest I've painted but for the amount of detail in the birds it feels really big. 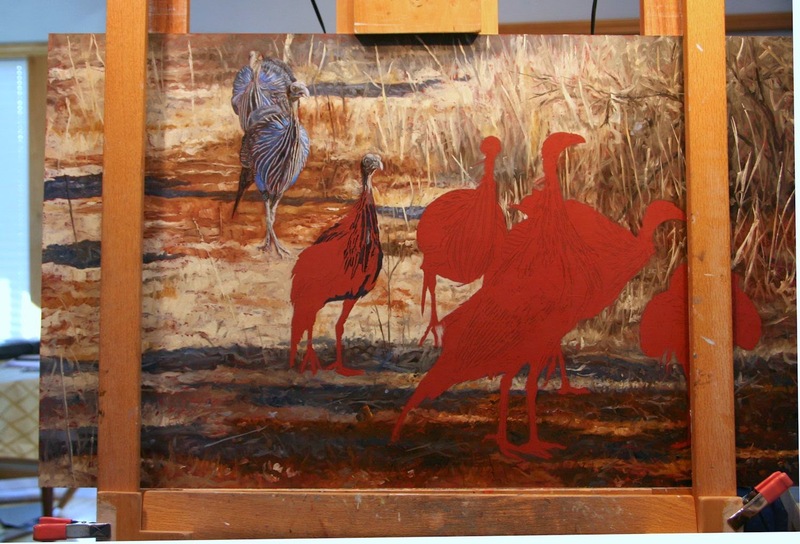 I don't want to rush the painting of each bird but as I work on this second to last bird I am really anxious to get to the final bird. 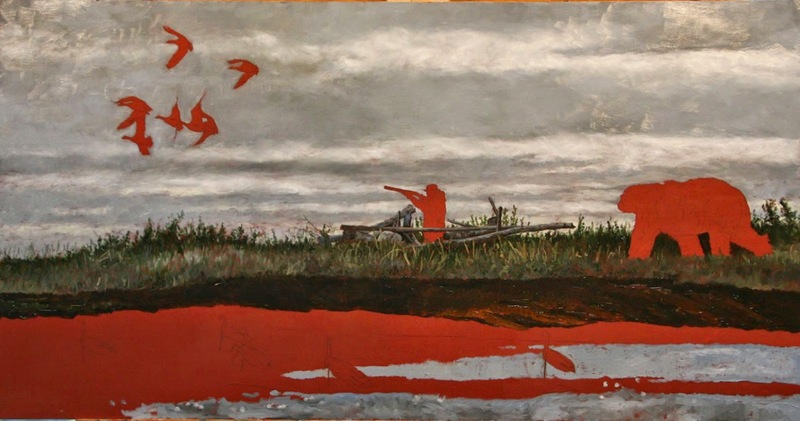 The whole painting rests on the biggest bird. Time to take a little break. 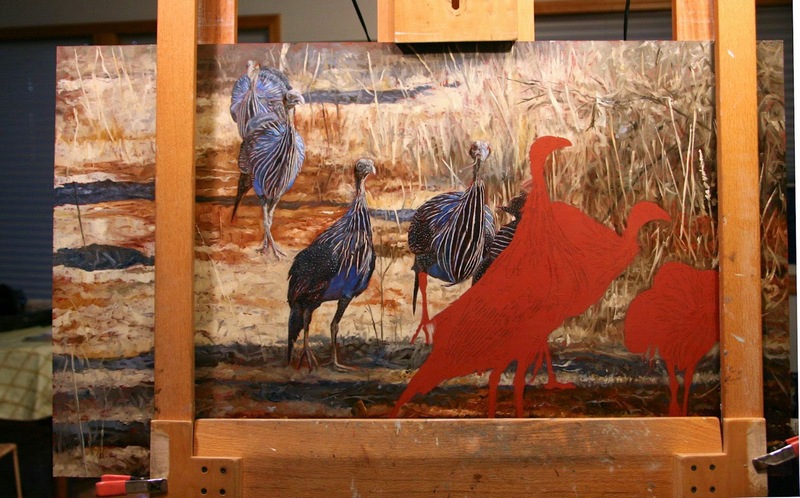 Not only is it good physically to move around the studio after a long painting session but I can return to the easel refreshed and excited about the bird I am working on. 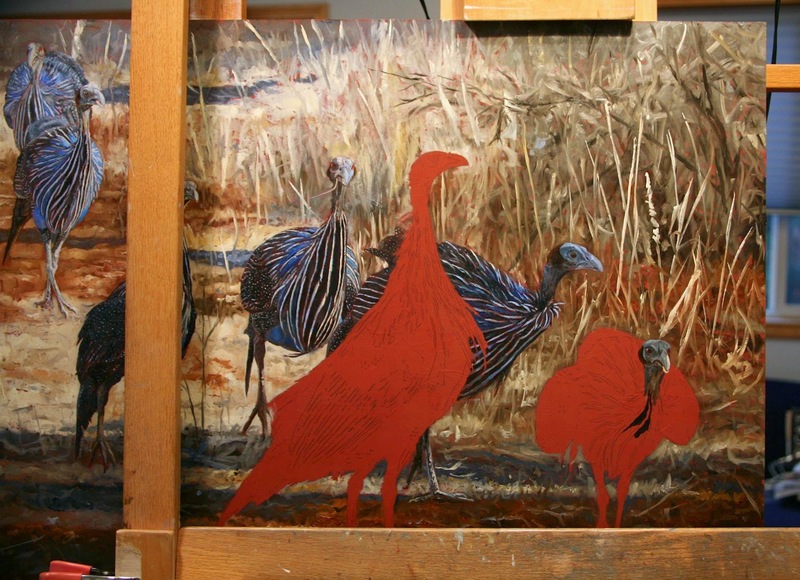 The back two birds are softer and as I move into these closer birds, the details are sharper. These latest two birds set the palette for the colors in shadow. I want the blue to be noticeable but not so bright that it distracts from the main bird. This "shadow" blue was tricky. I ended up mixing a lot of my blues, ultramarine blue, cerulean blue, cobalt blue, manganese blue, and Sevres blue to find just the right hue. This is one cool bird. I saw my first vulturine guineafowl in the wild in Kenya. The black and white feathers are striking but it is the cobalt blue breast which makes this bird a standout. 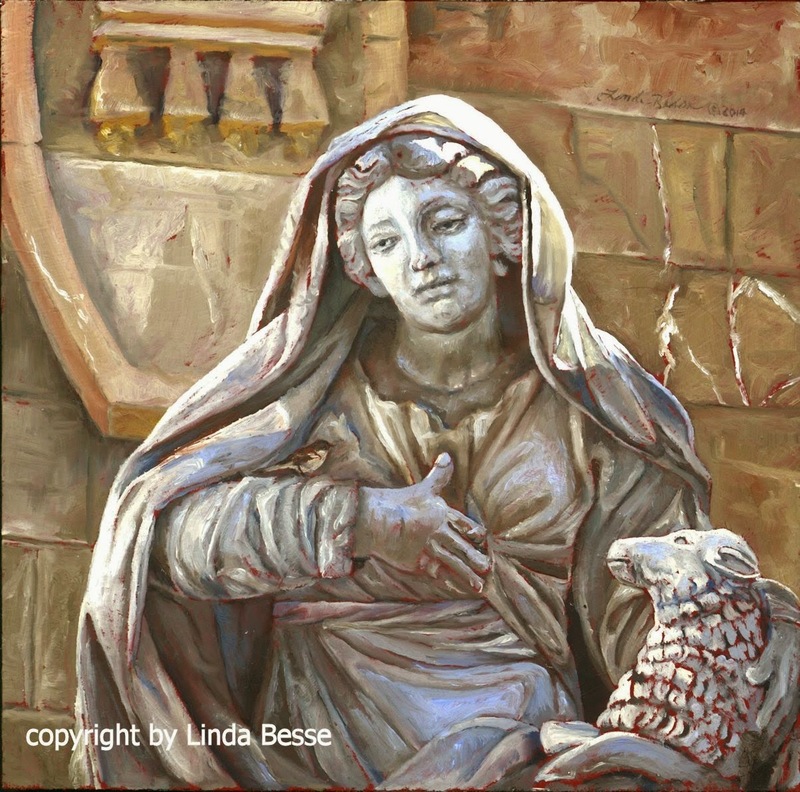 An artist friend of mine (Donna Yde) asked me how I choose my subject. The answers vary. Sometimes a color comes to me and I choose the subject because I feel like painting blue or red or yellow. Sometimes the idea that has been rolling around in my head for years is ready to be painted. 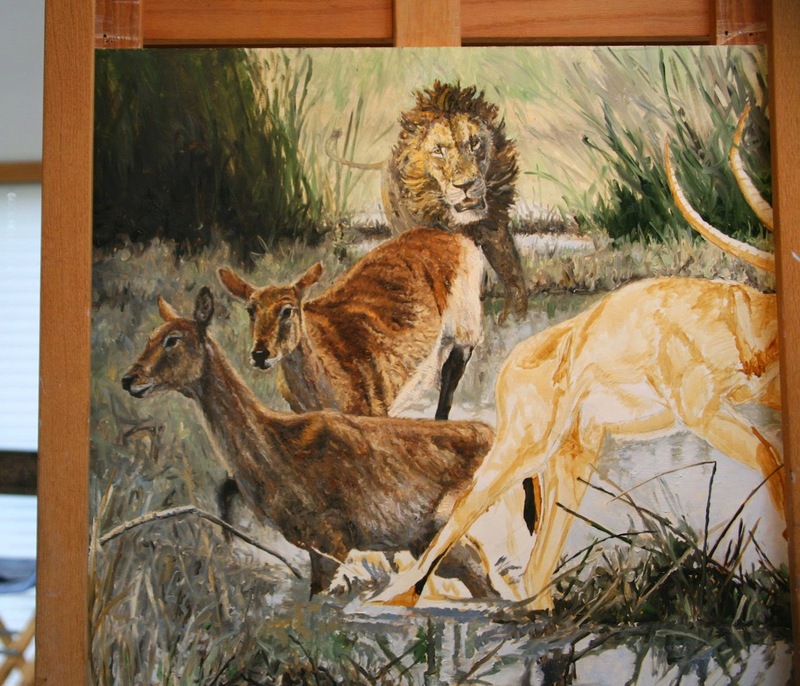 Sometimes I want to switch continents from my last painting or move to a different class within the Animal Kingdom. This painting is all of the above. I really wanted to paint a brilliant blue. The idea has been hatching since 2009. I just painted North America and wanted to paint Africa and since my last piece focused on a mammal, time for a bird. For this painting the title came before I even picked up a brush. The hunter is after white geese (Snow and Ross) but the title is also fitting for the large white hunter entering from the right. Often when my husband and I are trekking down the shore a long ways, we opt not to bring the heads. Sticks with wind sock bodies. Seems to work just as well. 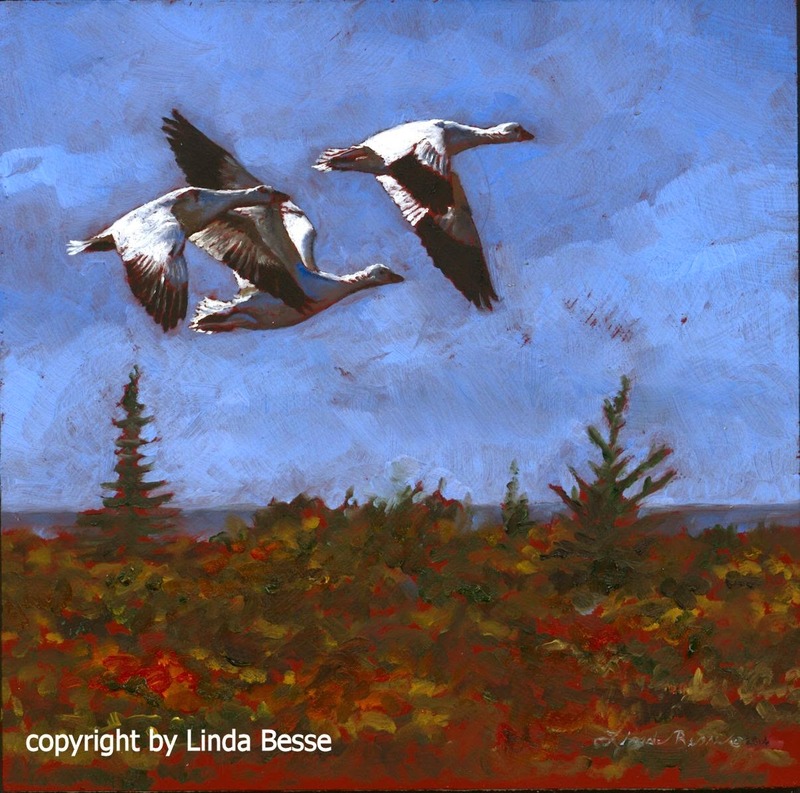 In flight it is often hard to distinguish Snow geese from Ross geese. Hunting regulations categorize them together as white geese. Ross are smaller and do not have as thick or large a bill. 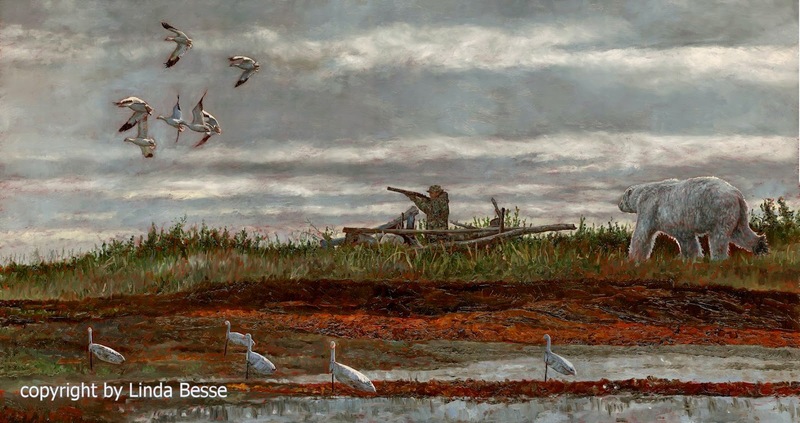 A large adult Ross is bigger than a juvenile Snow goose and each species can have smaller and larger birds. This scene is beside Hudson Bay. With a 14-foot tidal change, the landscape changes dramatically throughout the day. That browny-black area is the dried seaweed pushed up by the tide. Streams come into the Bay from the tundra and low tidal areas form numerous wet areas like the foreground. Walking along the Bay can be almost impossible in areas. You can sink up to 18 inches or more in muck. By the time you get your boot out (hopefully still on your foot) you have an extra 5 pounds of mud on each foot, black oozing mud which reeks of anaerobic sulfur. I prefer the higher ground. Walking back at the end of the day. The tide is out and this stretch is easy compared to most. My husband in the lead, my footprints will be next. With the landscaping taking shape, you can now see the emerging story. Each fall I head north to remote camps north of Manitoba. I don't hunt but do understand the necessity to reduce the snow goose population now devastating the tundra with its population explosion. 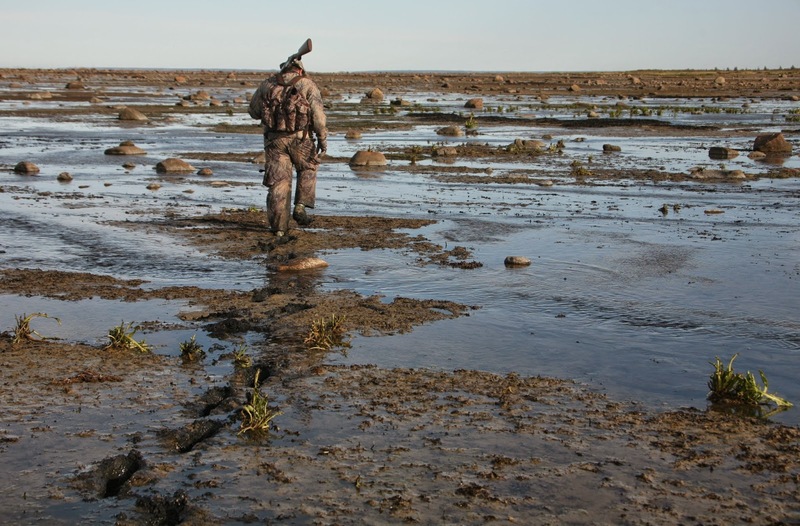 Snow goose hunting is a whole other sport in polar bear country. Do you really want to bag a bird when you see polar bear prints all around your blind and yesterday a polar bear was in the blind? To add to the excitement there are also wolf tracks. You walked from camp. There is no ride back. And I don't have a gun. It would not be an exaggeration to say this is not for the faint of heart. I was tired. Concert week (I sing with the Spokane Symphony Chorale which performs with the Spokane Symphony.) We had 4 rehearsals and two concerts in 6 days. Not a lot of time to paint. 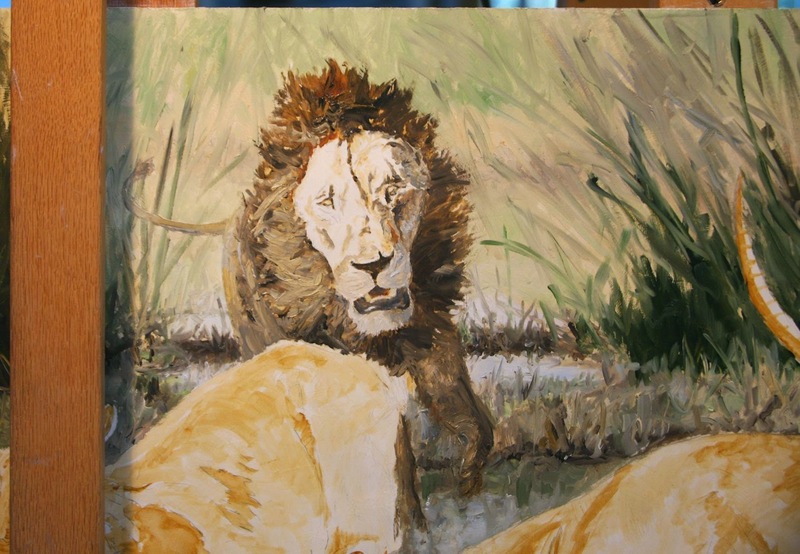 And, I had an uneasy feeling about my painting. Something wasn't right. I had already painted the sky and the birds. Why not forge ahead and figure out the problem as I go? No, I needed to listen. So, after the 2nd concert I headed to the studio to rethink my composition. The piece didn't have the energy I wanted. I worked on figuring out a more effective composition until 2:30 am. Yes. That was better, much better. And it just so happened to be the same size as my original concept. Out comes the palette knife and I scraped off paint from my board. Grabbing turpentine I washed off the remaining paint. After waiting for it to dry, I re-gessoed the board. Off to bed at 4:30 am. The board was ready the next morning for drawing. I did think of photographing the "destruction" of the original piece for my blog, but it was 3:30am and I didn't want to walk back over to the house to grab my camera. Every artist has their own way of approaching light and shadow. Sometimes I go by feel (not very helpful in way of an explanation.) However, this time I made a conscious decision on how I would mix colors for the shadows on the fur. 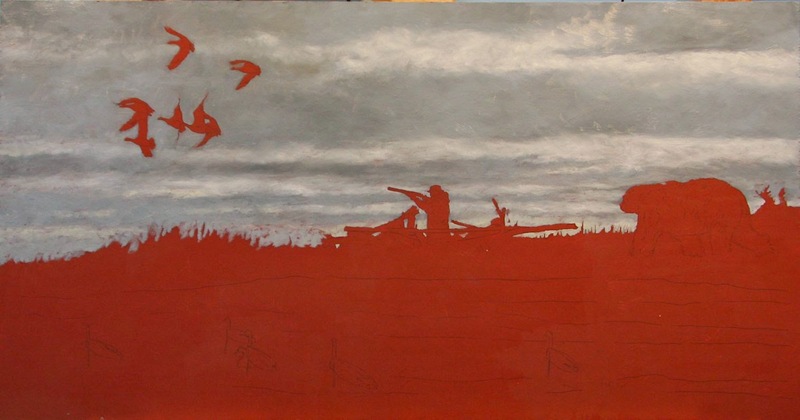 I thought bringing in the grayer of the sky colors would help unify the painting. By mixing ultramarine blue, a little King's blue, paynes gray and titanium white I had a color slightly bluer and more vibrant than the darkest gray-blue on the horizon. It is a delicate balance for the color. Too little blue and you don't have enough shadow, too much and you have a dog with blue fur! At first I thought I might be making a mistake with the bright orangey-yellow on his coat. It was so bright. But once I painted the burnt sienna and burnt umber around it, the coat glistened. When I make what appears to be a bold color choice, I need to listen to that inner artistic voice rather than the intellectual one which says, "what are you doing?? you are going to ruin it!" The artistic voice says, "give it a try," "be bold," and "you can always paint it out if it doesn't work, so why not?" Now that I have the grasses painted, it is time to move to my favorite part, the animal. 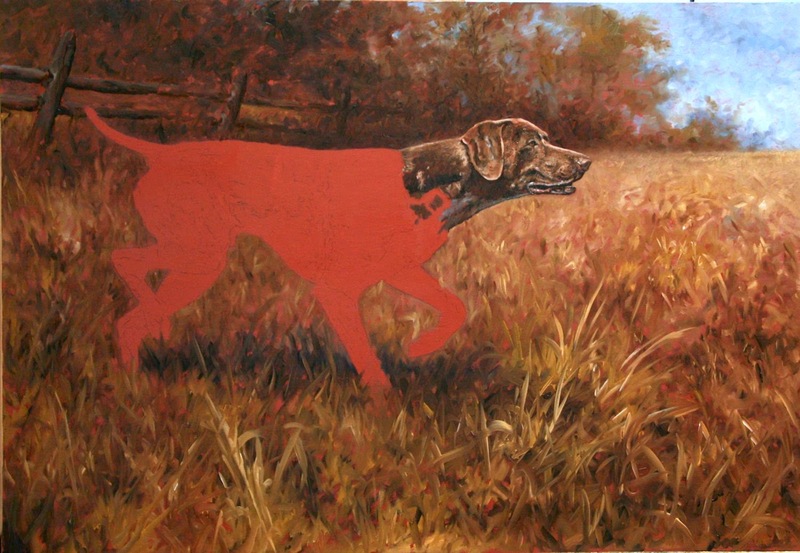 The dog's head takes the most time. First, I have to decide which colors to use. My reference was taken early afternoon so most of the 1100+ photos are a bit washed out. However, I have some which have good brown colors. Still, much of the colors I will be mixing are from memory. 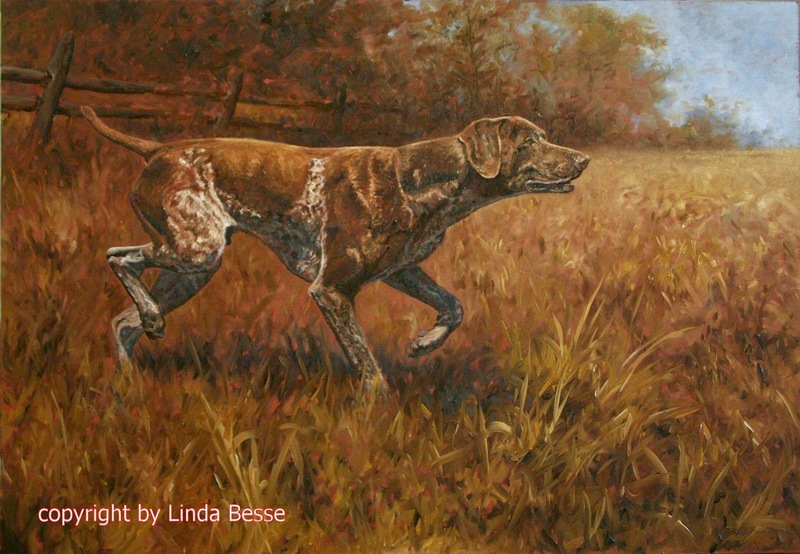 The way the dog's coat glistened in the light and the texture of his fur need to read as this German shorthair. Secondly, the head takes the most time because it is here in which you can feel his personality - and this is simply a great dog! 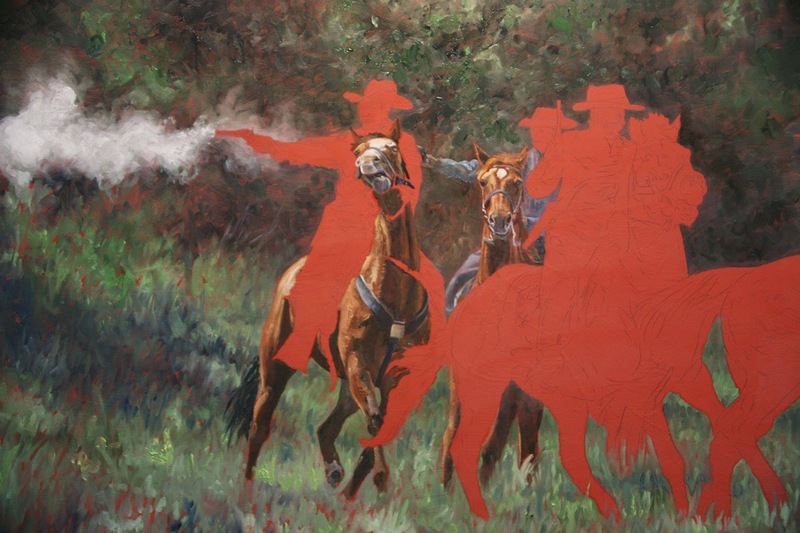 Just started this painting. 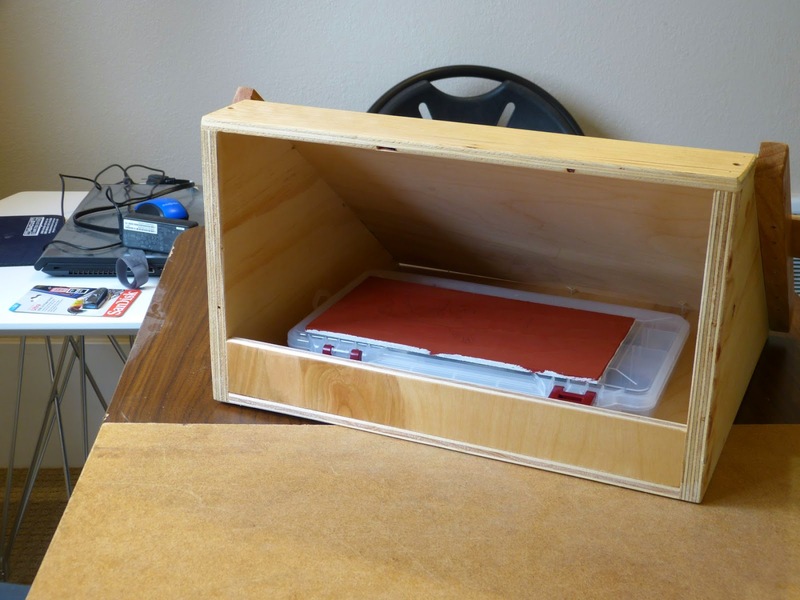 I debated whether to use the Venetian Red gesso as I did for my last pieces. Since I wanted an older look, I thought the red gesso would be a good fit. When I am asked to do a dog commission, I like to meet the dog. Watching him move and interact gives me a sense of his personality. 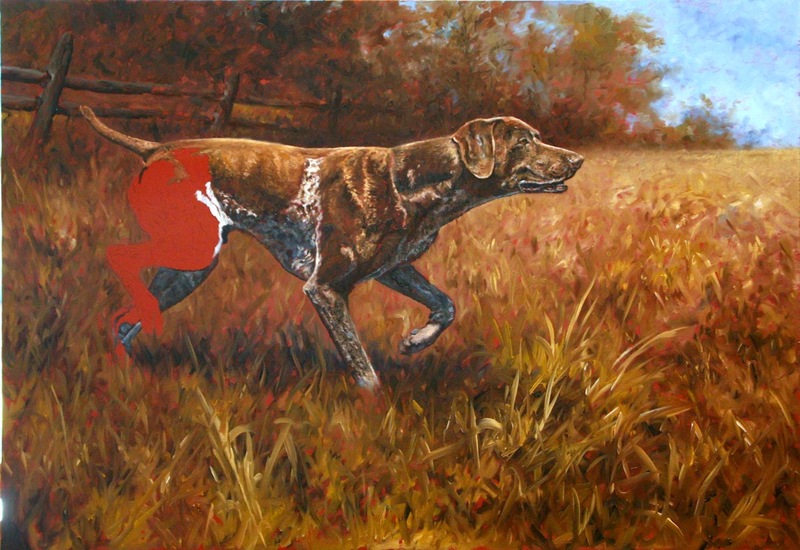 I am not painting any dog or breed, but a particular individual. In this case, I drove 5 1/2 hours to spend an afternoon with him. Inspiration can come from anywhere. 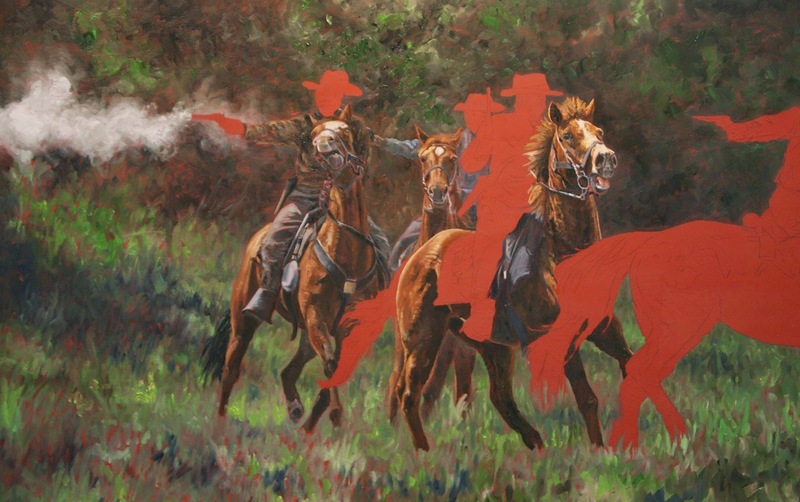 The idea for this painting originated from a Civil War reenactment I watched in June. 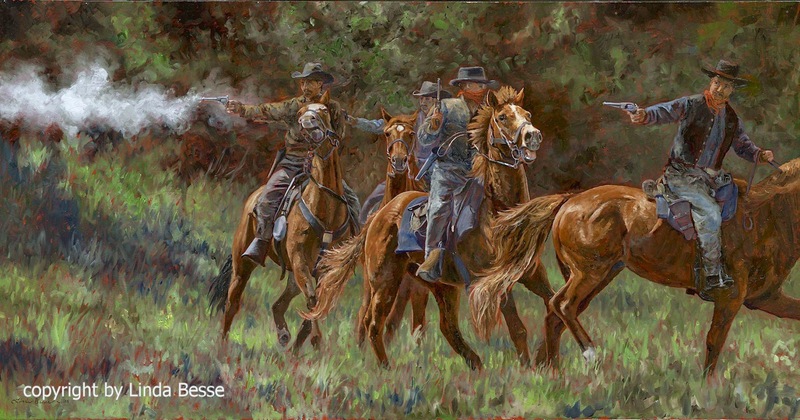 After a lot of redesigning (and help from published weapons expert Michael Cecil and his wife world-renown artist Krystii Melaine) I hope I have conveyed the feeling of Outlaws in the late 1860's - 1870's. Often at the start of a painting, I ask myself why I want to paint this particular piece. 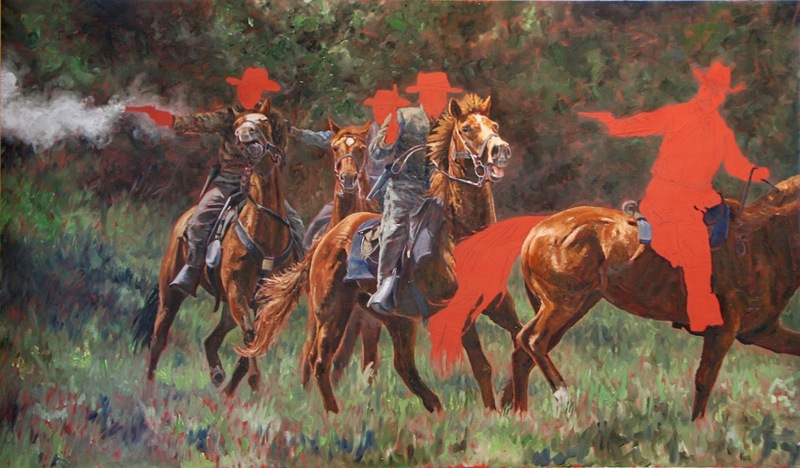 For this painting, it was the third horse. The focus. Everything about the horse screams...paint me! 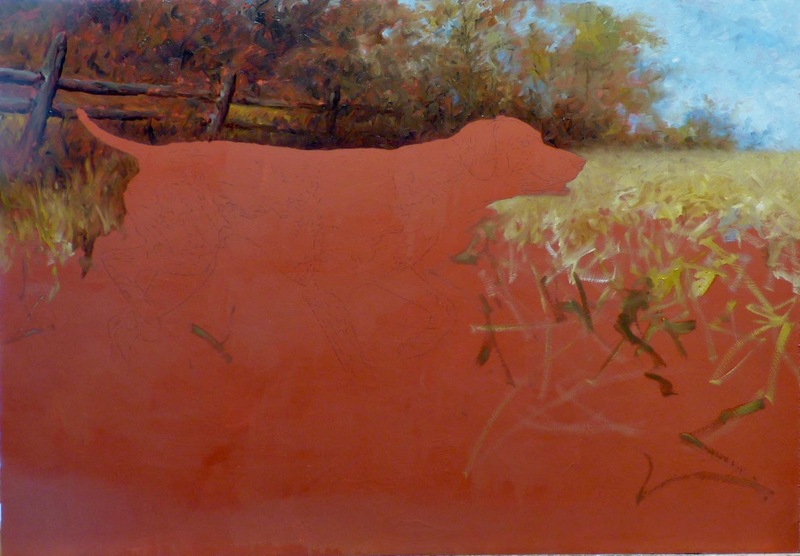 Now that I am playing around with this Venetian Red gesso, I thought I would use it on a medium-sized piece. This piece was finished before my trip (see previous post) but I did take photos of it in progress. It is a bit of a departure for me, a piece of wild life in place of wildlife. I just returned from northern Manitoba. It was my 6th trip to this region of the world. There is nothing quite like being in the tundra in the fall with its brilliant colors. Being in polar bear country is the icing on the cake. 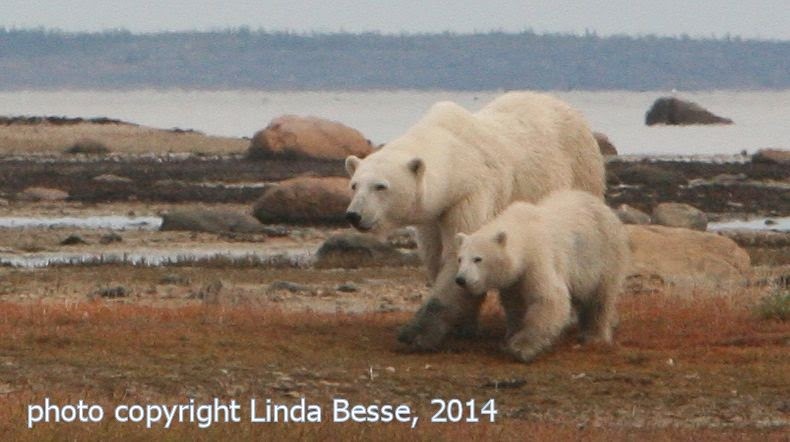 I was in a remote camp north of Churchill (www.webberslodges.com) and not only saw this mom and cub, but other bears as well. Snow, Ross, and Canada geese were migrating south and I was treated to numerous sightings of peregrine falcons perusing the Hudson Bay coastline. It seemed to be just moments after I arrived home that I was at the Spokane Valley Arts Council Auction and Sale which took place Saturday night, September 27th. I participated in the Quick Finish along with 17 other artists who were painting, sculpting, and carving in front of the patrons before the auction began. Just before the Quick Finish pieces were auctioned, I received the Nancy McLaughlin Award for the best female artist. Quite an honor when I saw the stunning art that was there. It was a spirited night of bidding and my Quick Finish, Silent Auction set, and both my Live Auction pieces went home with happy patrons. Here's a tricky one. Water. How is this going to work with this new palette? I'm used to working with the many colors of water but that is starting on a white to orange base. "Diving" in, I start mixing colors. Usually I would do a value study using a raw sienna/ burnt sienna turpentine wash. Not needed with this Venetian Red gesso. I'm exploring how much to let peek through and finding the richness of the background is working pretty well. The greens seem to sing. 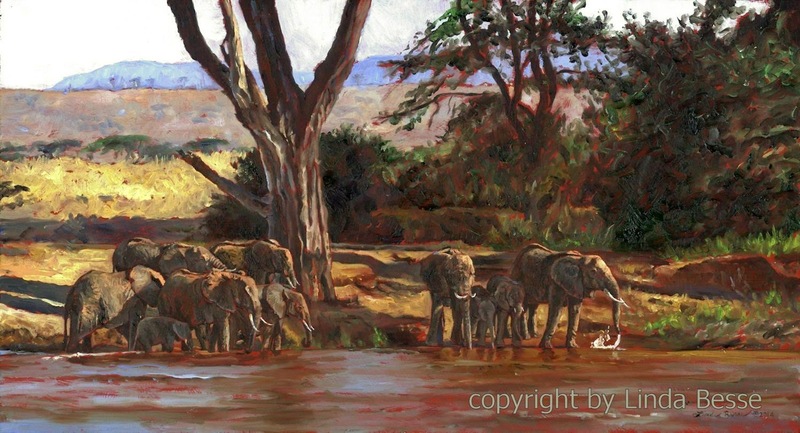 Getting that splash of yellow on the left side of the painting has added some brightness which it needed. Click on the photo to enlarge it and you can see all the red in the main tree. Adding more naples yellow for the sunlit sandbank helps the darker areas read as shadows. A while ago I bought some Daniel Smith gold gesso. It is metallic and I liked its effect on some small paintings. I also saw some Venetian Red gesso which I thought someday I would like to try. There are three miniatures I wanted to do so I ordered the red. Why not go for it? I gessoed each miniature with the Venetian Red then drew my reference outline. 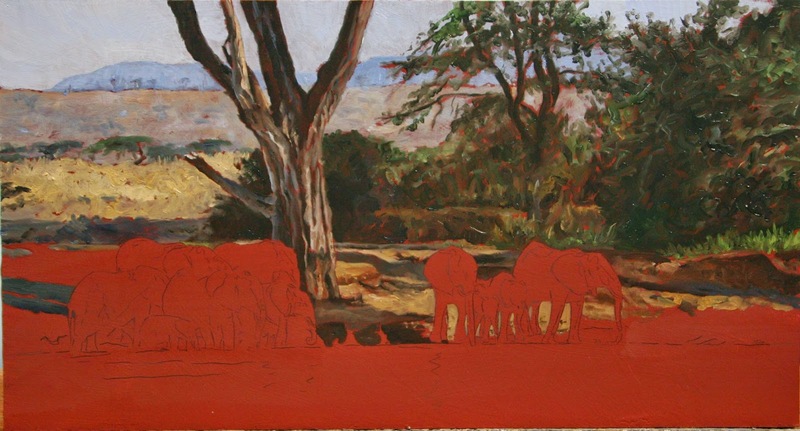 Beginning with this elephant piece, I mixed my usual colors and started with the sky. Aaaaagggghhkkk! Totally wrong color! It is much too light and dull. I mixed a new oil color and it was only a little better. Hmm. This Venetian Red gesso is going to call for a complete overhaul of my palette. The colors I would usually mix are just not going to work. There are two choices: 1.) 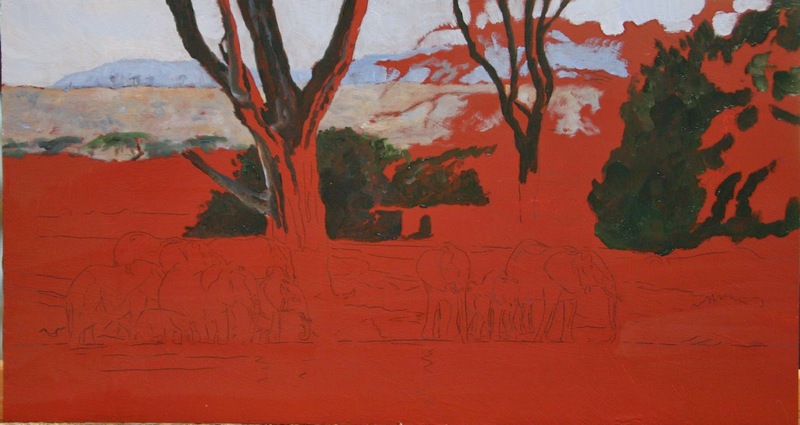 Wipe off the paint and put white gesso over this red. Major downside, I have also gessoed the other two miniatures with the red AND drawn those pieces. 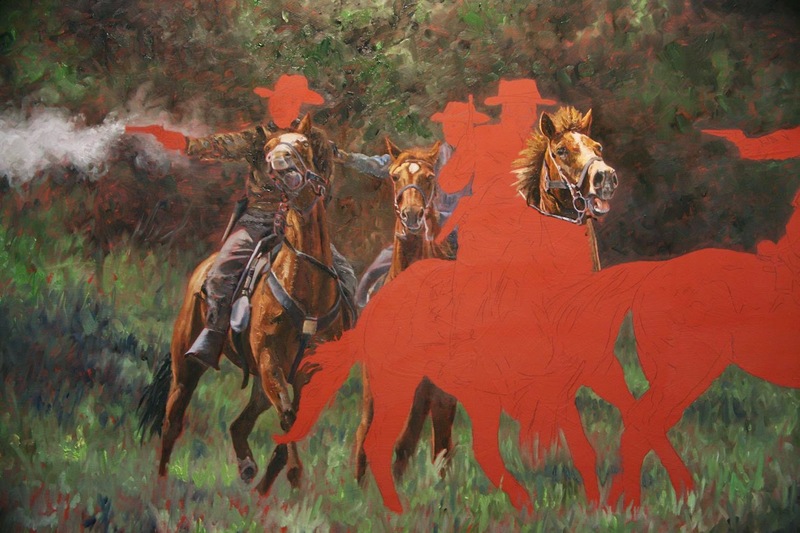 This would mean starting over on three paintings. OR, 2.) give this a chance for 90 minutes. If I haven't figured out how to rethink all my colors, I can go to option 1. Well, I passed the 90 minutes and kept going. I think this is going to work. I am almost done. I thought when I got to this point all that was left were the splashes. Not quite. The hind-quarter of the ram needs to be heftier. The shadow underbelly of the ram needs to be less sharp. And, I think the lion is all wrong. Well, mostly wrong. He needs to be less defined which will give greater depth to the scene. And, I think I should switch the lighting to the other side of his head. This is a group of artists from around the world dedicated to supporting nature through their art. 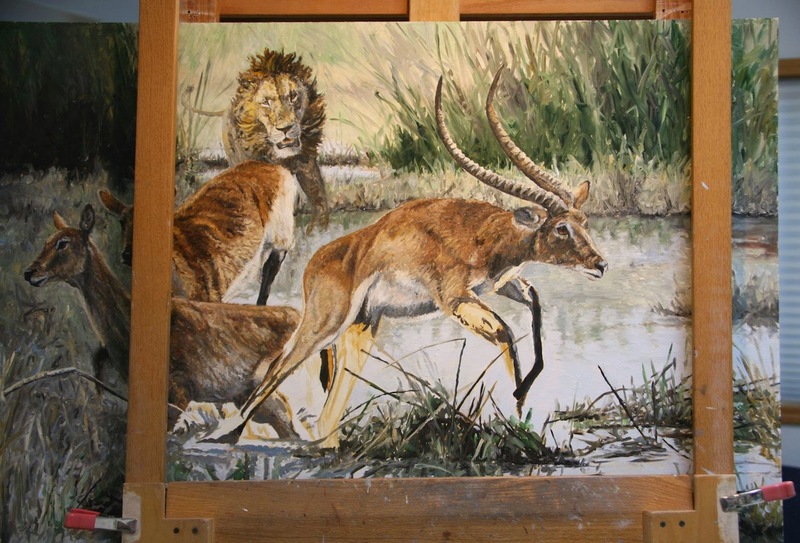 The success of the painting hinges on this lead lechwe. OK. I admit it. I did not see a ram in this particular group. But, to make the composition work, I needed to turn a female into a male. Though most of the details were worked out when I originally drew him, I still wanted all these prints in front of me as I painted. 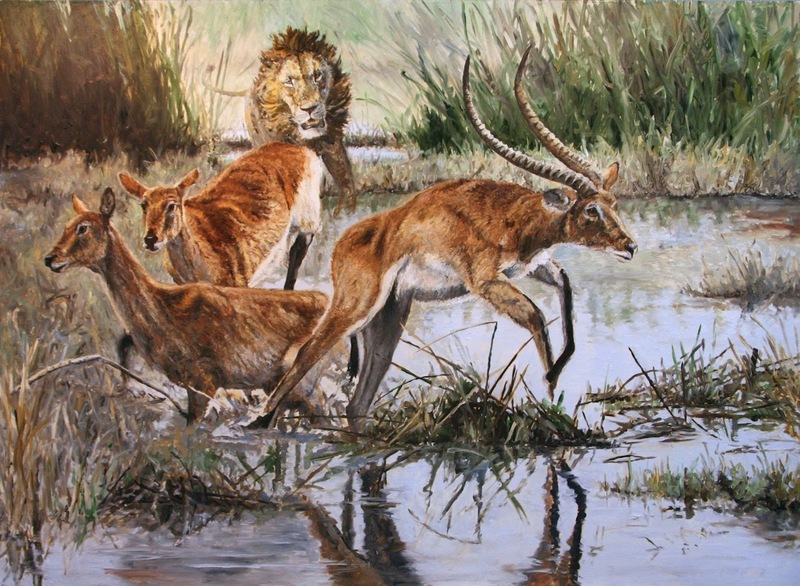 Red lechwe are perfectly suited to the Okanvango Delta of Botswana. 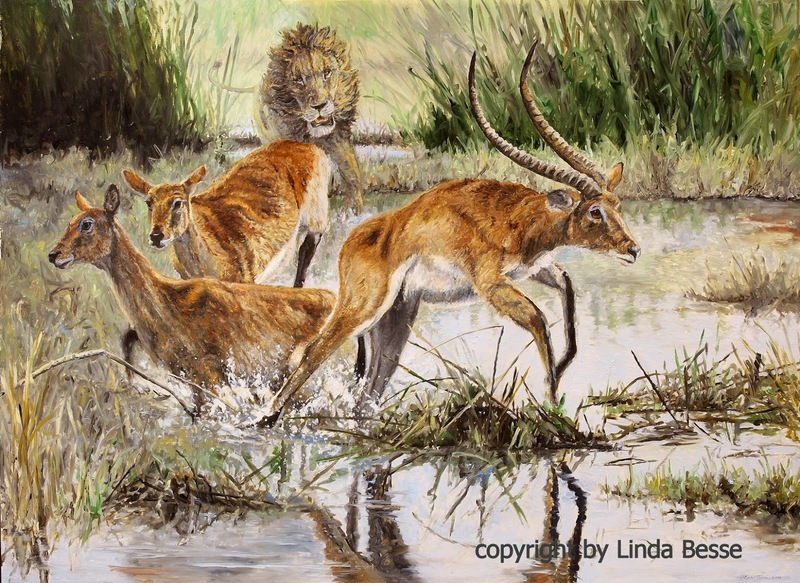 Preferring aquatic and semi-aquatic grasses, the lechwe's hooves are long and splayed enabling them to move easily in the environment. 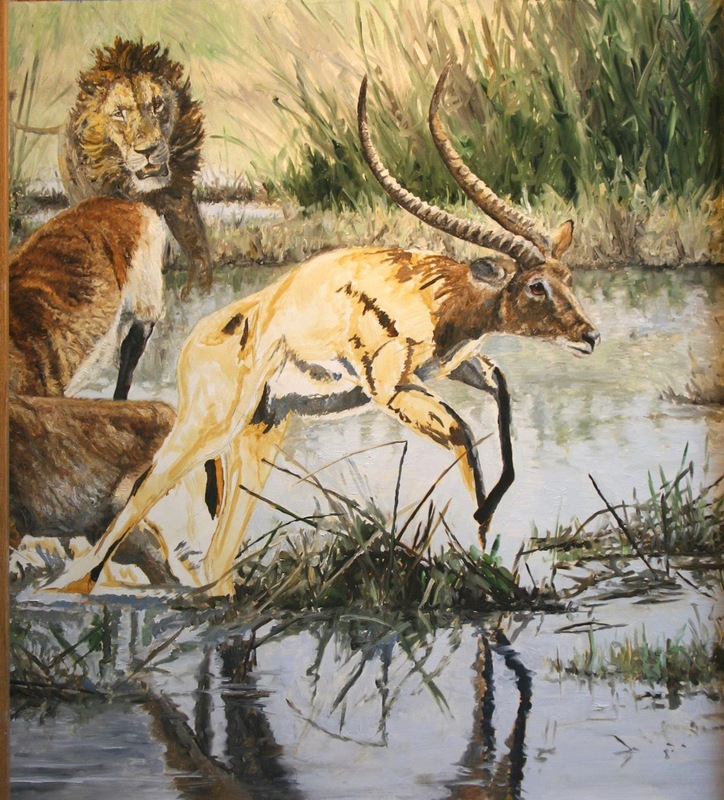 With powerful hind-quarters, these antelope can make great leaps to escape danger. 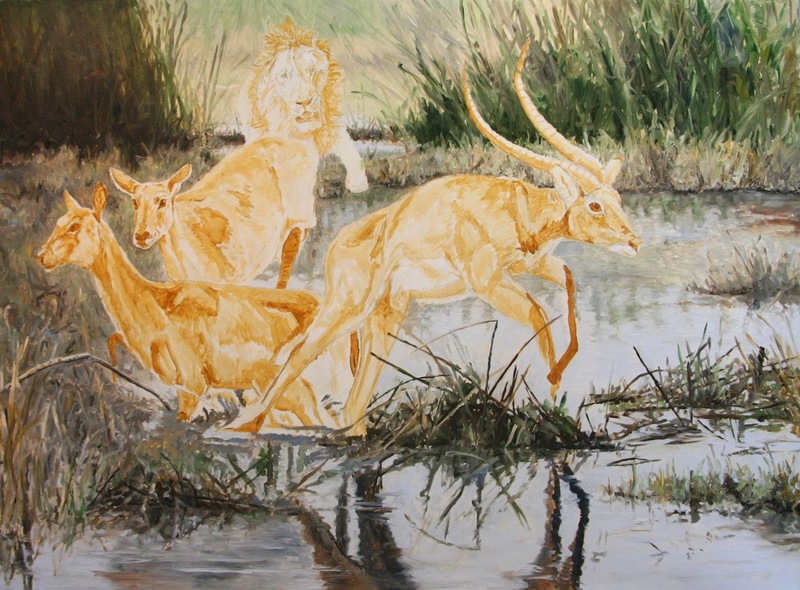 I started with the lechwe in back and then moved to the more shadowed one. The idea of the lion is simple. I needed a reason for all the leaping! I've done some simplifying of the scene. Too many sticks would distract from the action. Artists often have ideas for months even years before they have the time, resources, or inspiration to paint them. Yes. 1999. I have had the ideas for this painting rolling around in my head since 1999. I was in the Okavango Delta in Botswana in a mokoro, a dug out wooden canoe. My guide was standing in the back pushing me along with a pole. Seated, my grass mat was getting progressively wetter and I wondered how long we would stay afloat. As we rounded a high grass bank, we came across red lechwe. Females and several little ones. A couple of them were surprised by our presence. 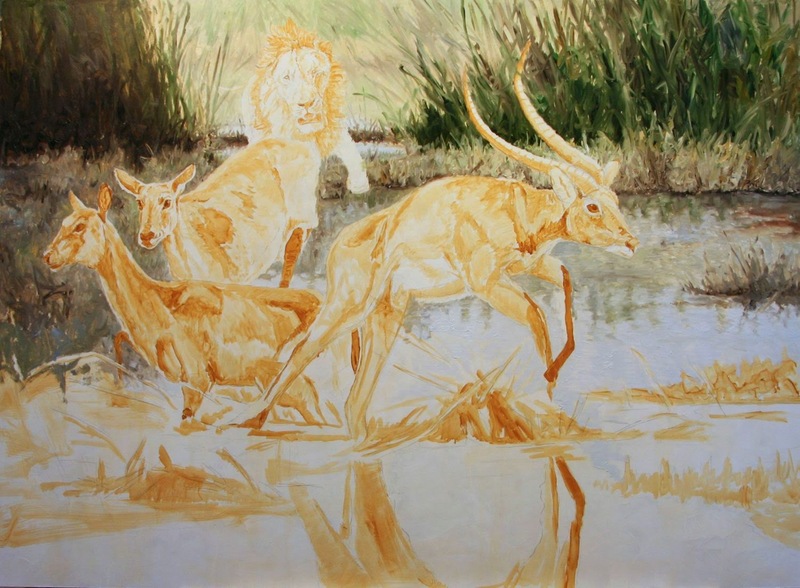 Over the years, I have glanced at my reference and thought one day I should paint something with red lechwe. I never got the feeling that I was ready to paint them....until now. 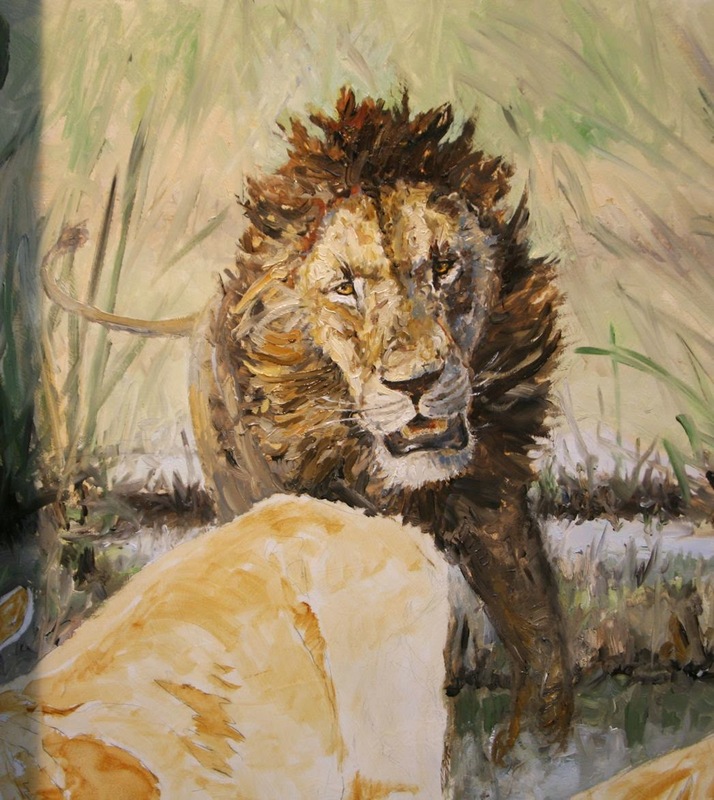 I want a good story and when I came up with the lion idea, I knew it was time. 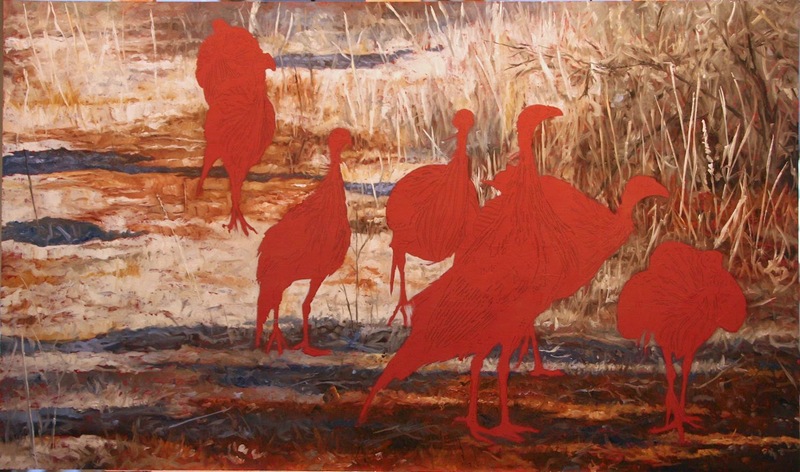 This is a large painting at 35" X 48". My painting Take Off has received another feather. (seems fitting for a bird painting.) 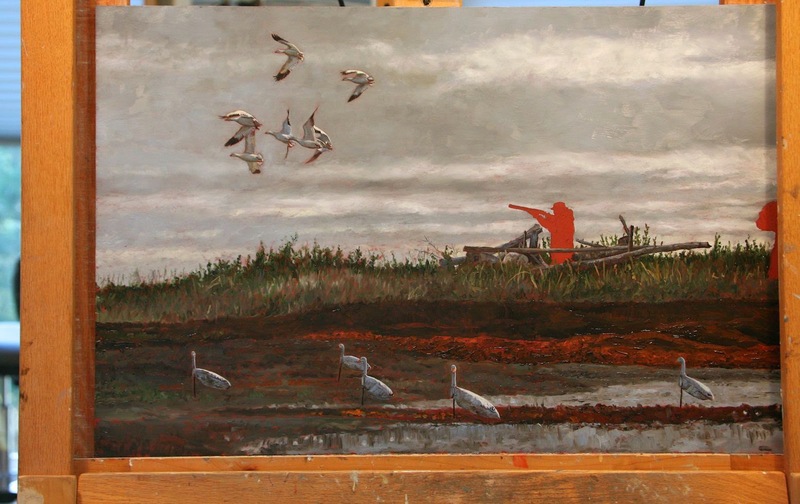 This painting of Tundra Swans was a finalist in The Artist's Magazine's Annual Competition. There were over 7500 total entries and Take Off was selected as a finalist in the Animal/Wildlife Category. 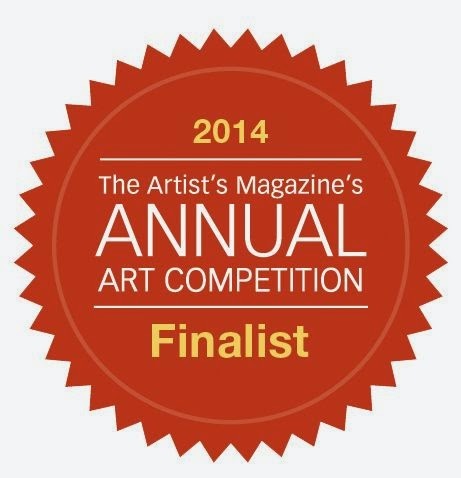 All the finalists and winners will be listed in the December issue of The Artist's Magazine. This is a wonderful magazine which I have been receiving for years. I look forward to each monthly issue, reading it cover to cover and often rereading my favorite articles weeks and months later. 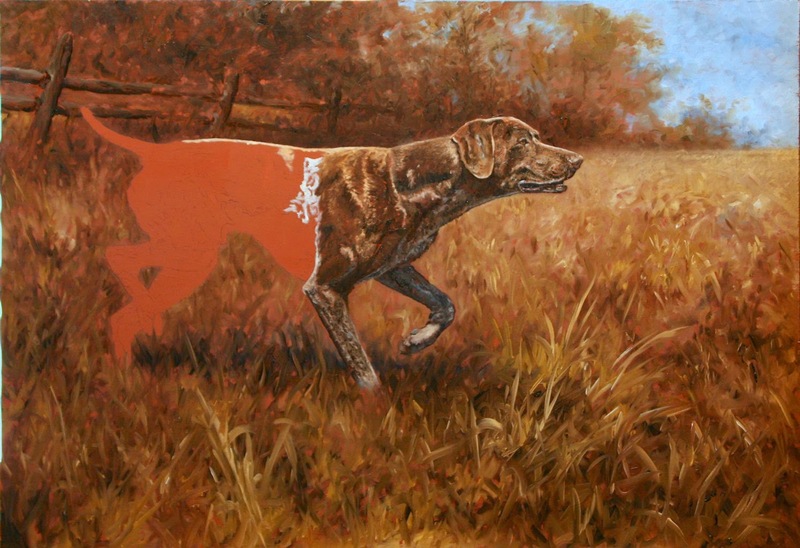 My painting Take Off has been accepted into the 9th Annual Juried Exhibition of the International Guild of Realism. If you aren't familiar with this group, check out their website at www.realismguild.com. The work is amazing and I am thrilled to be a part of this guild. I've been a member for four years and have had the good fortune to be juried into the Annual exhibit each year. This year the Exhibition will be in the exciting historic district of Charleston, S.C. Held at the prestigious Robert Lange Studios, the work will hang in the gallery from November 7th - November 28th, 2014. Artists will be there for the opening reception Friday, November 7th.